It's become an annual tradition around here to host a big party for Andy's birthday. 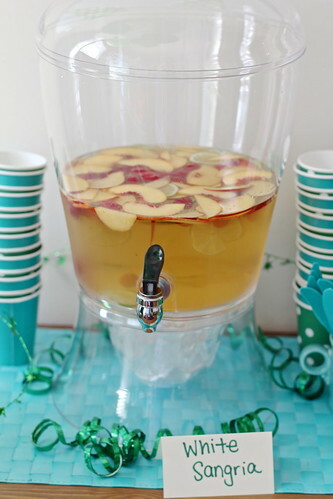 This year one of the highlights on the drink menu was white sangria. It's a really fun way to highlight seasonal fruit. It's light, refreshing, and just the right amount of boozy. Special thanks to my friend Caroline, mixmaster genius, for sharing the recipe! I quadrupled the recipe, which was just enough to serve about 40 people. Be sure to chill all of the ingredients before mixing. Combine liquid ingredients in a large vessel and stir well. Add fruit. Serve chilled, topping each cup with a splash of sparkling water if you'd like.